"Denmark is a small country, and we love to hear what the world says about us. So our idea was to send out an appeal for help to the Danes’ favourite holiday destinations, knowing that if it could recruit volunteers and create attention out there, Danish media would pick up on it and bring the story back to Denmark. Danish tv- and-radio personality Mikael Berthelsen read out a heartfelt appeal in local languages to the people of Thailand, Spain, Greece, Italy and France: Help a Dane in the sun. The campaign went viral and succeeded in changing lifelong behaviour, simply by asking locals for help. An overwhelming 63% of Danes has changed their sun habits as a result of the campaign." "Every year thousands of Danes travel to sunny destinations on holiday. 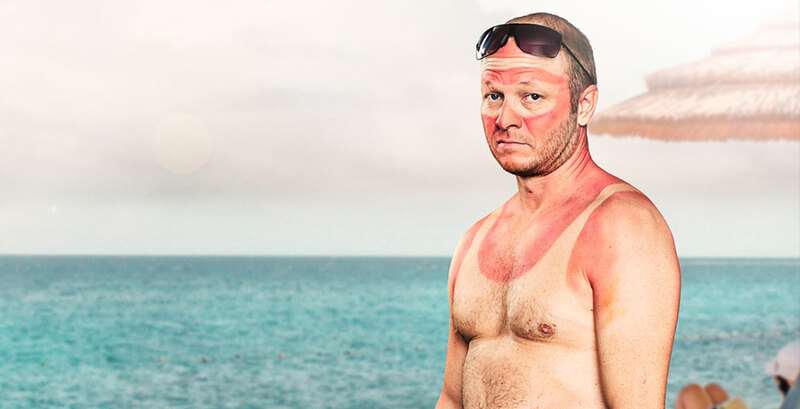 Unfortunately, many of them return home with sunburns that increase the risk of skin cancer. And every day a Dane dies from cancer in the skin. After 10 years of sun safety campaigns in Denmark, we needed a new strategy to make the Danes listen and change their sun habits. And we knew that if the world talks about Denmark, the tiny country in the north, the Danes will proudly listen. The media will pick it up." "Every year thousands of Danes travel to sunny destinations on holiday. Unfortunately, many of them return home with sunburns that increase the risk of skin cancer. And every day a Dane dies from skin cancer. With this project we were hoping to change the sun habits of the Danes and by the global strategy we where hoping to scale the message of sun protection and cancer awareness to the world. And, fingers crossed, we were hoping to create cultural bonds and friendships in this appeal for help and local volunteers." "Our breakthrough moment was the instant love and warmth the campaign was met with—across borders, cultures and people. We were quite anxious of how the appeal would be received in the various cultures. It was important for us to be very respectful in our appeal for each country. Quickly the campaign reached an explosive level with stories building more organic momentum and becoming a reference point in the news and social channels. But when we realised the campaign had gone from explosive to diffusion with stories being re-purposed through organic user-generated content and new stories spinning out of original content we knew we were onto something really big." "Our PR strategy was the foundation of the campaign, including social media which was essential to conveying our message. Especially Facebook, as Facebook has created a media without boarders for conversations to travel between cultures and people. Here people gather to be united by content and causes, caring and sharing. The campaign was built to create dialogue and relations. We reached out with the appeal, to get a reply, to get volunteers and hereby create relations to the Danes and to Denmark." "Cultural differences was both a challenge and a blessing. Reaching out to a country for help needs respect. Tone of voice turned out to be quite a challenge as we needed to be serious due to our cause and in respect for each country. Also we did not want to be too serious as we believe that the ability to laugh together is a great foundation for a strong relation, but humour varies across cultures. The language was also quite a barrier as our presenter did not have any previous experience with the five languages yet needed to come across as serious, respectful and humorous. The most rewarding moment was experiencing all the instant love and respect across borders, cultures and between people." "Thai, Greek, French, Spanish and Italian. And then of course the importance of being ready to adapt and adapt fast. The campaign sparked an abundance of user-generated spoofs, video replies and content. Our appeal went viral and got picked up by primetime news all over the world, and overnight, Danish sun habits were talk of the town. 12,000 people signed up as volunteers. Some volunteers even learned Danish and produced their own video replies. Local businesses and hotels made special sun offers for Danes and handed out free sunscreen. Local pharmacies guided Danish tourists to better sun safety and dermatologists offered free birthmark check-ups for Danes. Navigation and coordination was key." And every day a Dane dies from cancer in the skin. After 10 years of sun safety campaigns in Denmark, we needed a new strategy to make the Danes listen and change their sun habits.